Is it a coat, a sweater or a cardigan?! I’ve been so excited to show you a few projects that I’ve been working on for the last several months, including this Sweater Coat. It’s part of my “Colorful Life Collection” that I’ve put together using chunky, Color Made Easy from Lion Brand Yarn. 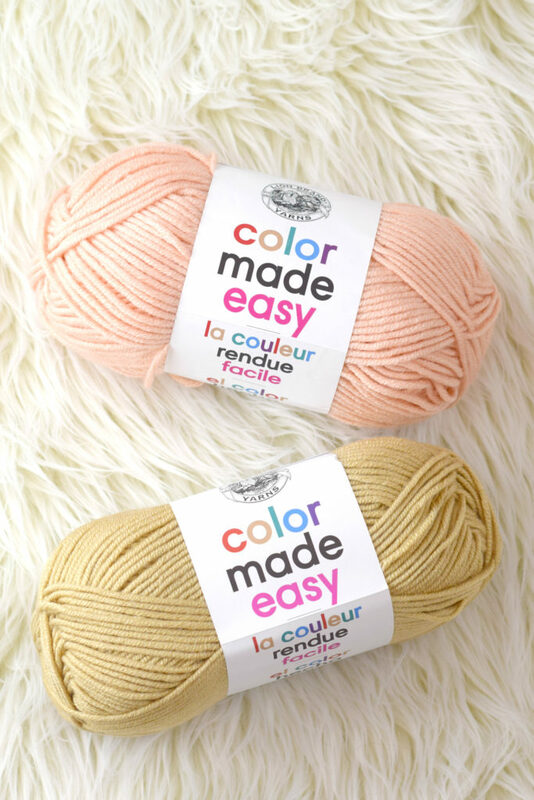 You can now find the Color Made Easy Yarn at select Michaels Stores, Michaels.com and LionBrand.com. 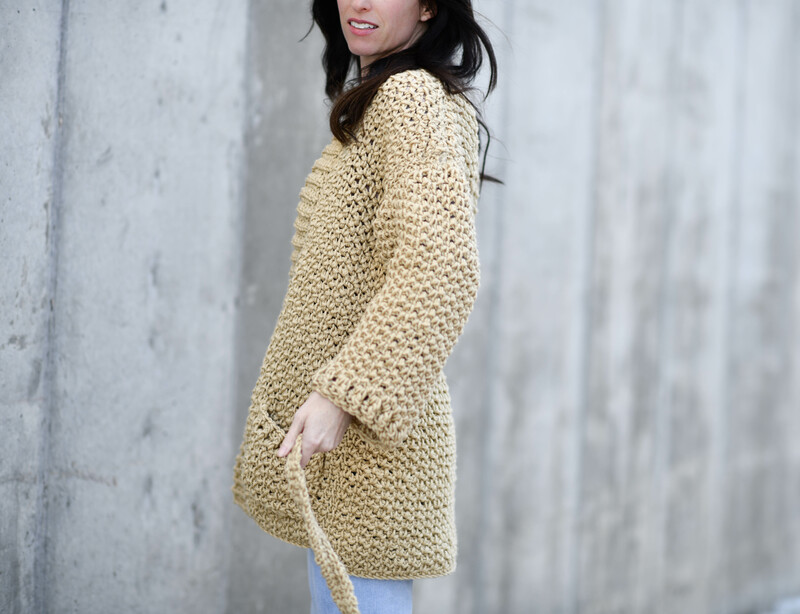 I’ll introduce you to my collection in a bit, but first want to touch on this fun, chunky crochet cardigan pattern. You’ll also find the full, free pattern for the Sweater-Coat at the bottom of this blog post! Who else loves using the big yarns? (Raises hand) If you follow my blog, you know I’m sort of obsessed with using super bulky yarns and chunky yarns. 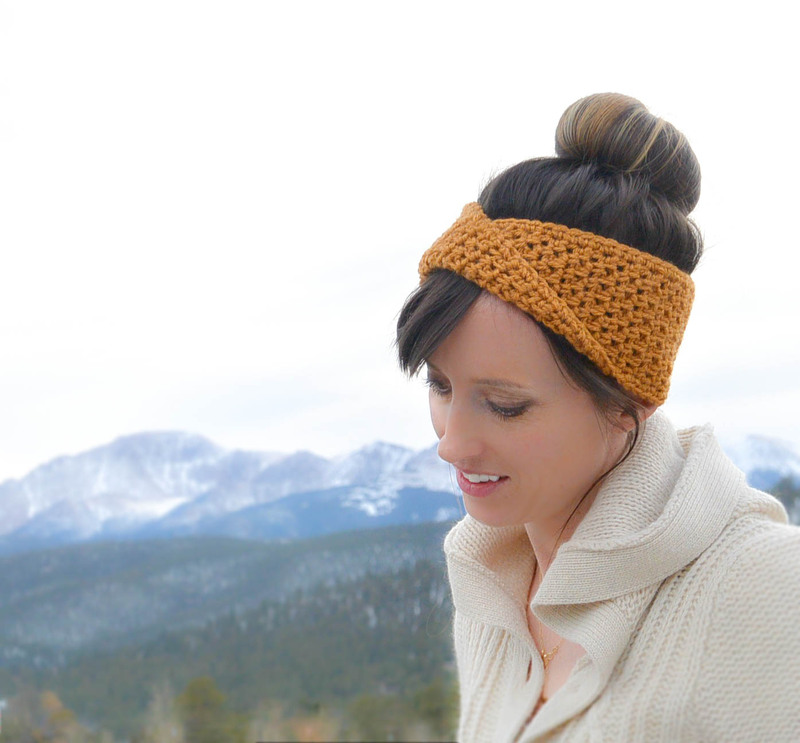 Not only do I love the look when they are knit or crocheted, but they also work up quickly. 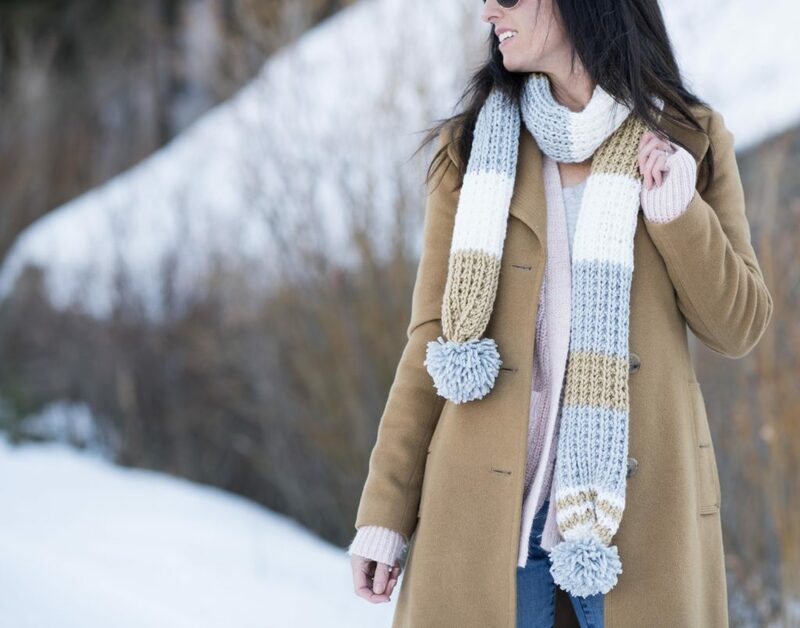 This Sweater-Coat is no exception as you can crochet it relatively quickly compared to many other sweaters made with worsted weight yarn. It also happens to be a simple pattern, made with basic shapes and very minimal shaping. I like the belt tie which is flattering to any body type and the cozy pockets. 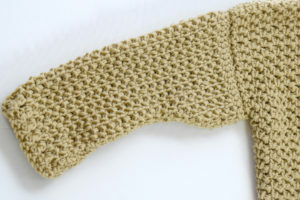 Below you’ll find instructions and also a link to my tutorial on how to crochet this cool looking stitch pattern. Above: The new, Colorful Life Collection. And look, there’s color on my blog! 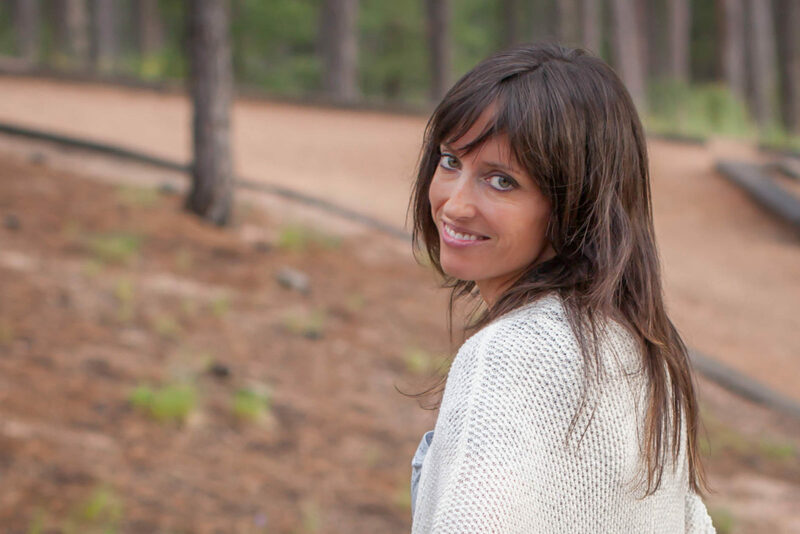 (Quick little happy dance) To me, living a colorful life means living life to the fullest! Read a new book, travel somewhere, make a new friend, learn a new craft, knit a new stitch, learn to crochet, laugh, love, and be grateful! Let’s live a colorful life this year, shall we? 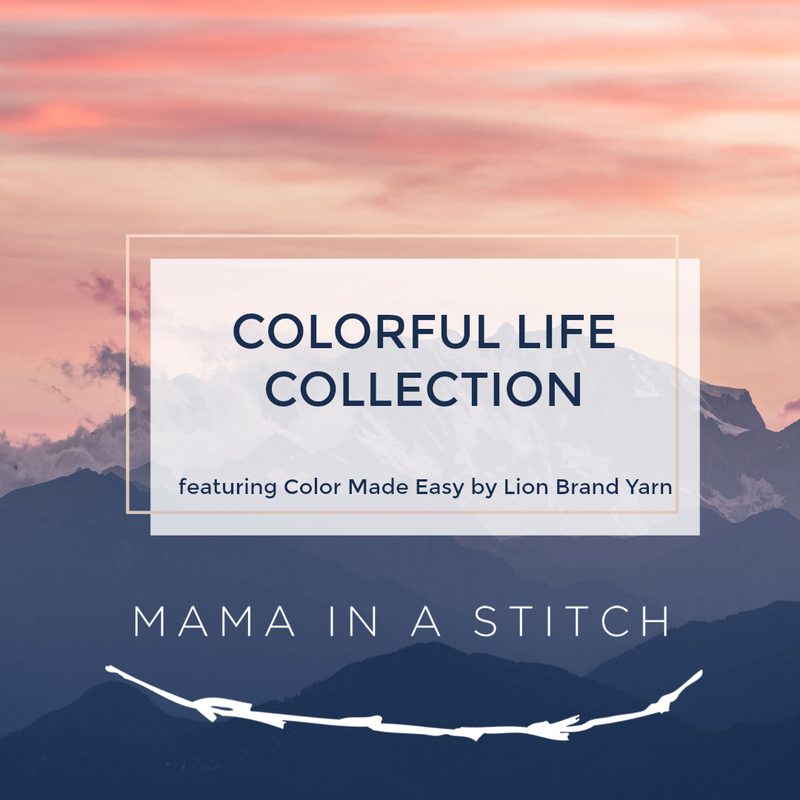 If you want to see more patterns and kits using this yarn, definitely check out all of the kits available from Lion Brand (HERE) by Two of Wands, Sewrella and Make & Do Crew. 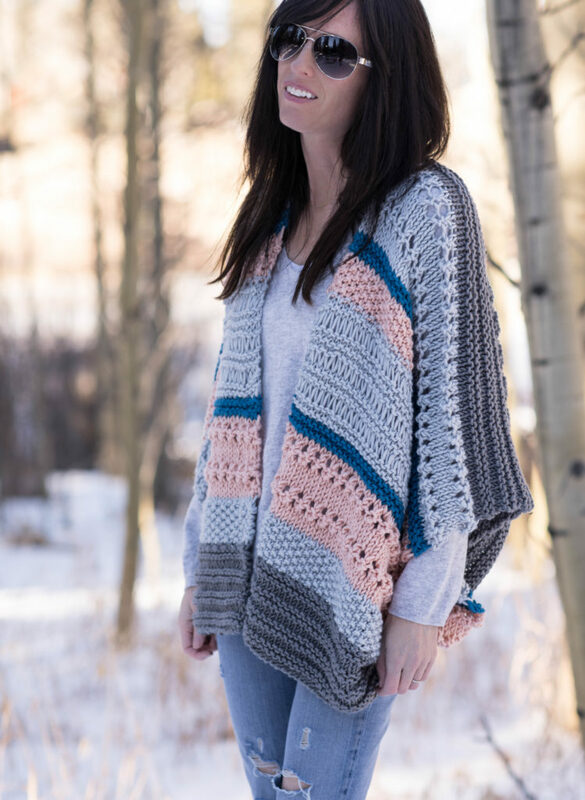 Above: This is the Monaco Kimono (kit available HERE for 20% off) and I will be sharing the pattern for FREE in the next couple of weeks here on the blog! 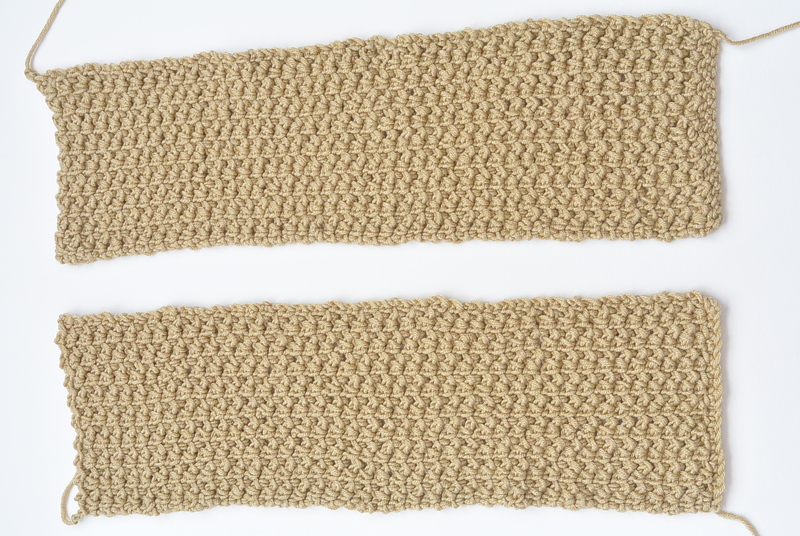 Above: This is the Fairbanks Pommed Scarf! 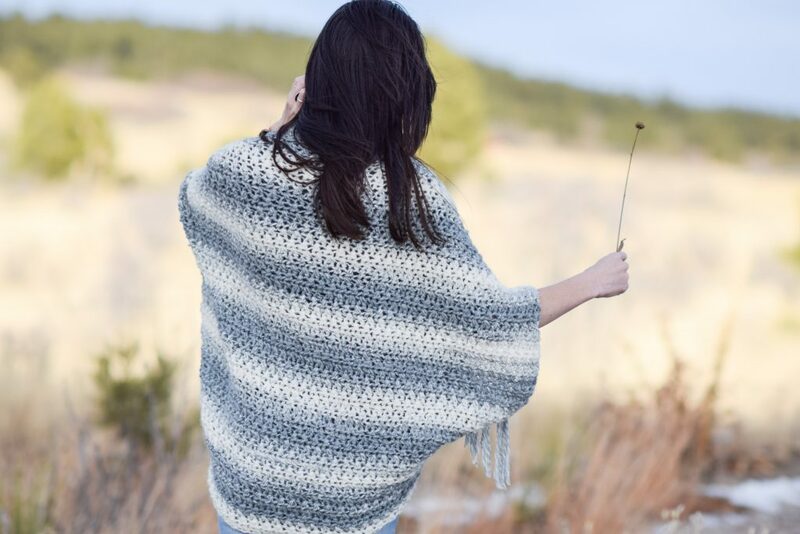 It’s available now as a knit kit from Lion Brand Yarn (currently 20% off) and I’ll be sharing this one on the blog for free as well in the next couple of weeks. Do you have a favorite chunky yarn? My fave used to be Woolspun, which was discontinued, so I was excited to learn that Lion Brand was coming out with this comparable yarn. I’d say it’s even better than the Woolspun in the sense that it’s 100% acrylic so there are no worries about wool allergies. 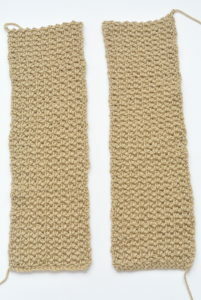 It’s very soft, has a nice drape, and the stitch definition is awesome. Okay, shall we get to this pattern?! 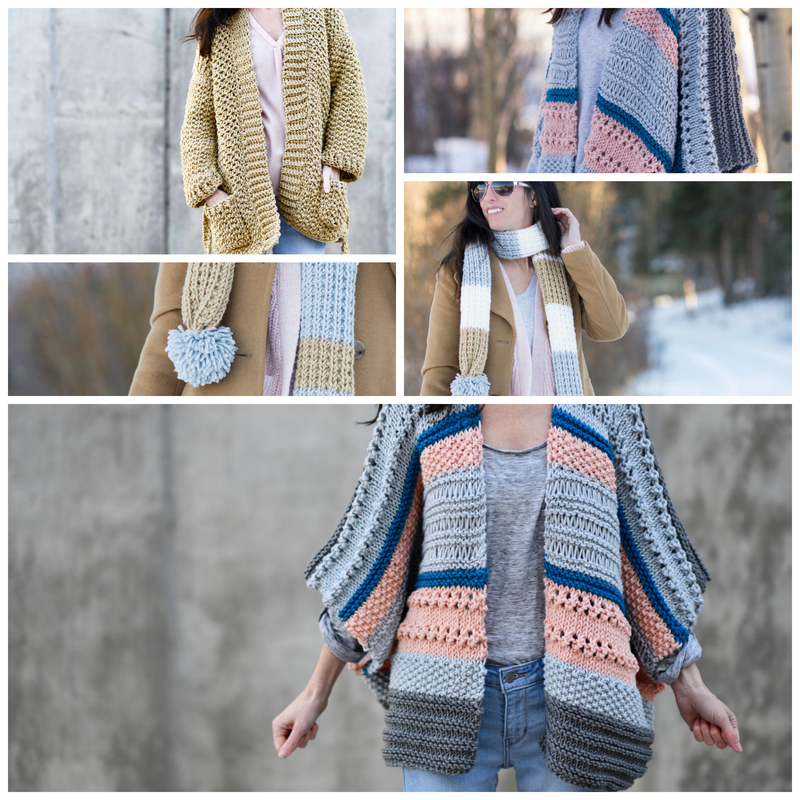 Pattern Description: Is it a sweater, a cardigan or a coat? How about all three! This sweater-coat can double as a light jacket or chunky cardigan. 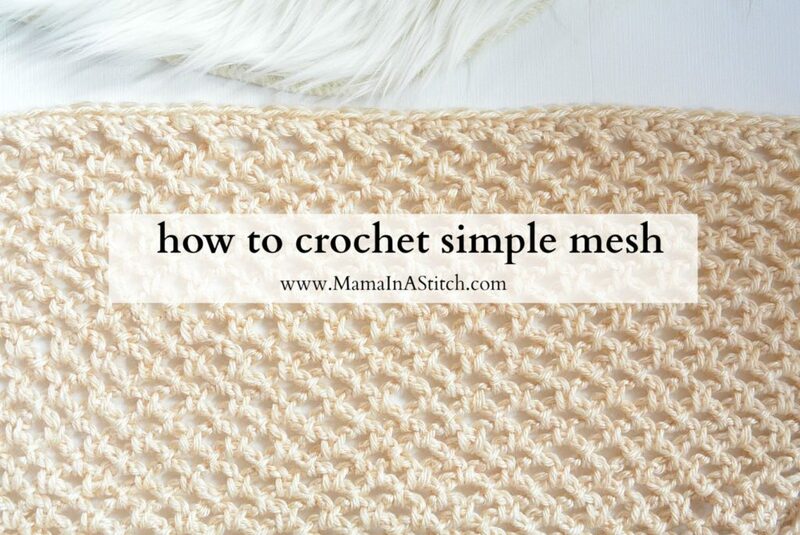 The simple stitch pattern is easy to memorize and it’s a breeze to crochet as there’s only light shaping on the sleeves. The sweater features practical pockets and an optional belt-tie to keep you cozy. 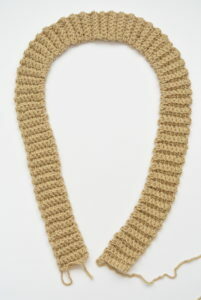 Add the beauty of a textured crochet stitch and you’ve got a piece that won’t go unnoticed. This sweater-coat is made in several pieces. There is one rectangular back panel, two rectangular front panels and two lightly shaped sleeves. Each piece is worked separately and then seamed to finish. The collar, pockets and belt are then each crocheted separately and sewn onto the sweater. Repeat row 3 until piece measures approximately (26”, 27”, 28”, 28”) long. Tie off and weave in ends. Repeat row 3 until piece measures (26”, 27”, 28”, 28”) long. Tie off and weave in ends. Repeat this pattern one more time to make a second front panel. Row 6 Turn, *ch2, sl st into next ch2sp; repeat from * across the row. Row 2 Turn, fp hdc in 1st st of row, *bp hdc in next stitch of row, fp hdc in next st; repeat from * across the row, tie off and weave in ends. Fold sleeve in half and seam with a simple whip stitch seam. Repeat Sleeve Pattern one more time to make a second sleeve. Below: Crochet the collar separately, then whip stitch to the cardigan. Repeat row 3 until your pocket is approximately 4.5” tall. Row 2 Turn, ch 2, fp hdc in 1st st of row, *bp hdc in next st, fp hdc in next stitch; repeat from * across the row. Repeat Pocket Pattern one more time to make a second pocket. Finish by working slip stitches around belt. Tie off and weave in ends. Place front panels on top of back panel, one on each side. Using your tapestry needle and a length of yarn, sew front panels to back panel with a simple whip stitch seam working up each side and along the shoulders. Leave arm openings for the sleeves. 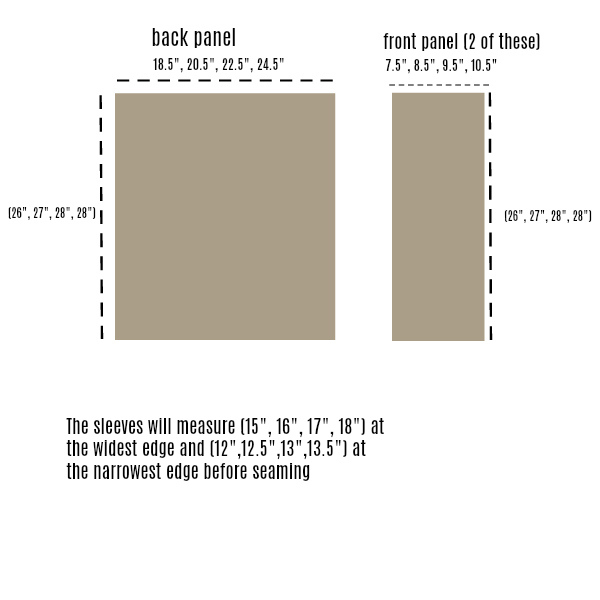 Sew sleeves to arm openings with preferred seaming method. 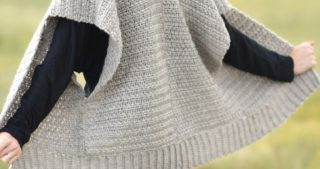 Attach collar to front of sweater by sewing with a simple whip stitch seam. The collar is placed on the inner edge of each front panels and sewn evenly in place. See photos of sweater for visual assistance on where to place collar. Sew pockets onto front panels with a simple whip stitch seam. Block to shape and size as desired. Weave belt into stitches on each side of the sweater-coat. 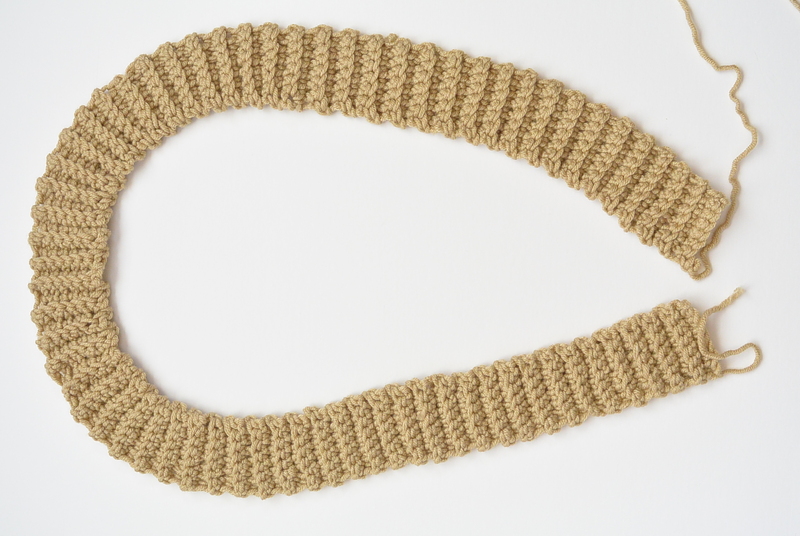 There’s no need to crochet belt loops. Have you worked with chunky weight #5 yarns? I can’t wait to use it more often! Would love to see more knitting patterns. So darn cute! Might be what I make – waiting on my yarn for the pink cardi you just put out. I love crochet and knit so am excited to see this cardi in crochet. I love this cardigan, Jessica! I would also be interested in a larger size! This cardigan is beautiful, Need to go shopping for that yarn, have none in my stash! I would love to make this in 3x and 4x. Would you have the pattern for those sizes? 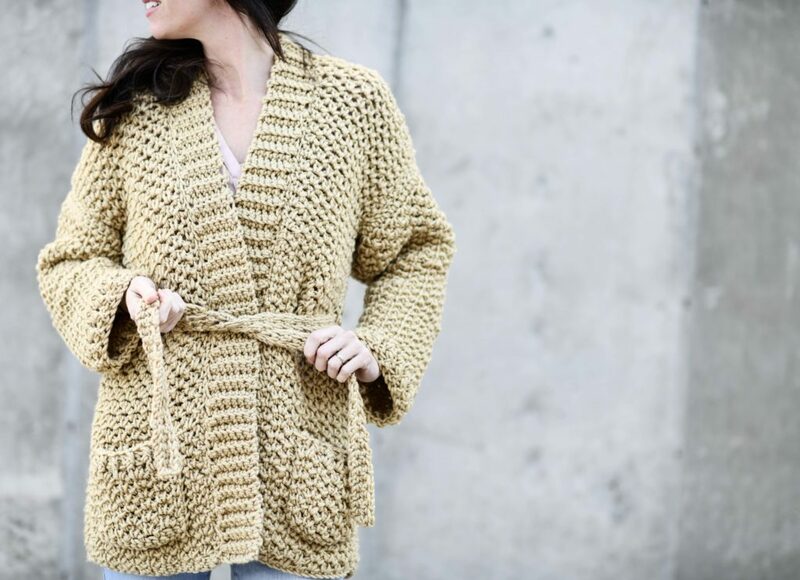 I would love a comparable cardigan sweater coat in a knitting pattern! 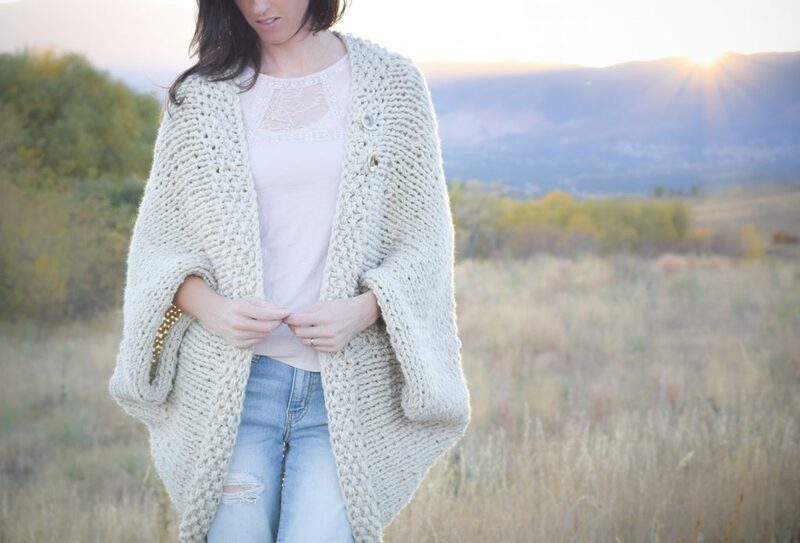 This is gorgeous and I love cardigans! I love this pattern. It reminds me of one I made in the 70’s and wore it out long ago. I need a larger size also. It is a matter of having broad shoulders and back. I think I will try making the back 2 or 3 inches wider, since there isn’t a lot of shaping. 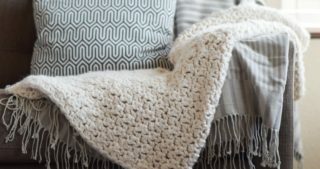 I have been getting your patterns for quite a while now and I enjoy them a lot, although I don’t love the bulky yarns as much as you do. I am bulky enough as it is :). This is perfect for the Pacific Northwest. I plan to make the pink one you published recently also. Thank you so much for doing the hard part for us to enjoy. I am interested in a larger size 3xl. I would love something similar to this in a knitting pattern! Gorgeous! Sorry, I thought my previous comment was lost, oops! I love this pattern! But I also love super bulky (#6) yarns. 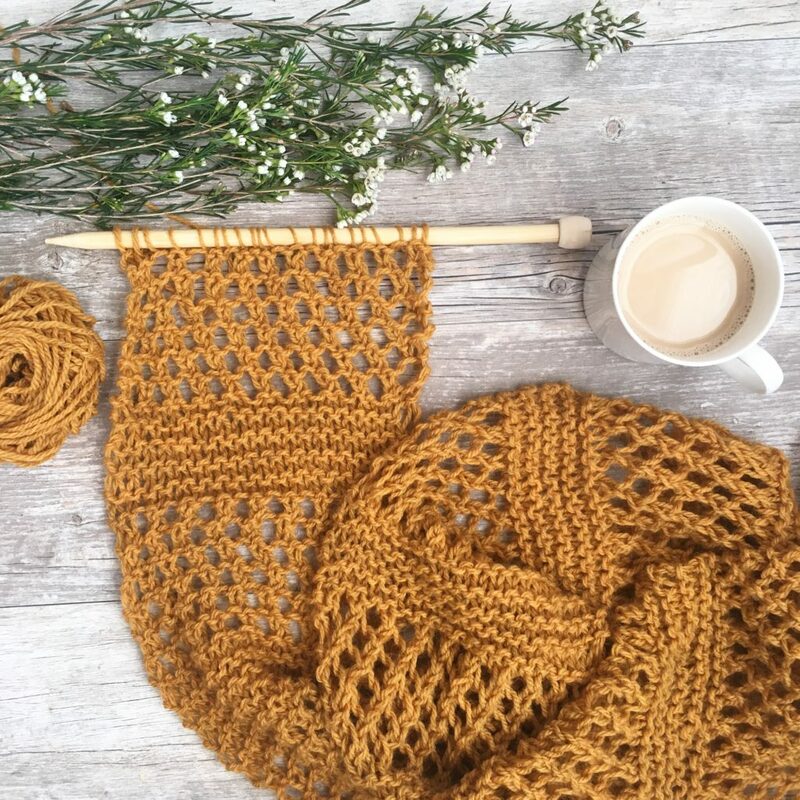 Is there an easy way to convert it for that type of yarn? Thanks! 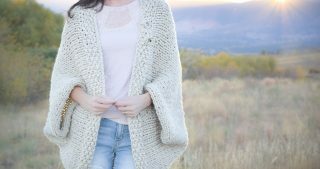 I have a super bulky 6 cardigan pattern coming out soon! it would be nice if we could make it in larger sizes llike 3x. i love all you do . can not wait for that next sweater to come out. Did you use the chain 3, slip stitch (with necessary blocking), OR chain 2 slip stitch for the example I am looking at in this email? It’s the chain 2. Thanks for asking!